I have not gotten a hands-on look, but from the features list, the app looks like it’s well worth its $8 cover price on both Android and iOS. It basically breaks down into three functions: digital character sheet, dice roller/play support, and accelerated character creation. 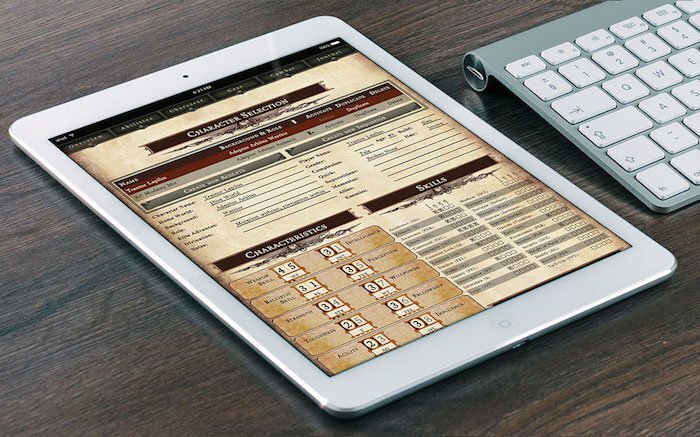 As a character sheet, it adopts the 40k parchment aesthetic of the books and standard character sheet. It purports to have all the mechanical fields, including Skills, Talents/Traits, Psychic Powers, Corruption/Insanity, and the like, as well as the descriptive fields like appearance and personality traits. 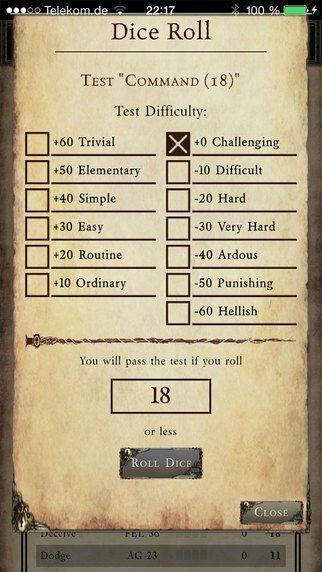 Assuming the performance of the app is smooth, this should help in navigating the relatively dense Dark Heresy character sheet, especially as characters advance. The character sheet is connected to the dice roller to support play. I want to try this, because there are typically various modifiers to track, especially in combat. I doubt it’s robust enough to capture all of these situational boons and banes, but there’s a lot of opportunity to ease the mental math, even if it doesn’t eliminate it entirely. On top of that, there’s a “Journal” function for note-taking, which is a nice touch. What I’m really excited about, though, is in-app character creation. There are unofficial, community-made character creation spreadsheets available, but they all have their own quirks and idiosyncrasies. For a game as lethal as Dark Heresy (seriously, you should be killing a PC every couple weeks), it would be a huge benefit if players could quickly reroll within an app and have a new character ready to reinforce the warband within 20-30 minutes, rather than ending that player’s night. I hope to have the app for review in the coming weeks, but based only on first impressions, this deserves more attention. This entry was posted in News and tagged Apps, Dark Heresy, Digital Character Sheet, Enemies Within, Fantasy Flight Games, FFG, News, RPG, Warhammer 40k, WH40kRPG. Bookmark the permalink. Have you had chance to review the app?